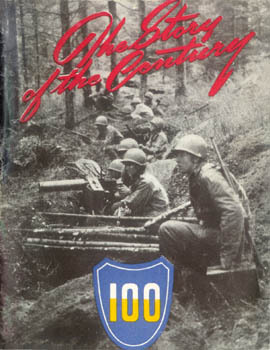 "The Story of the Century" is a small booklet covering the history of the 100th Infantry Division. 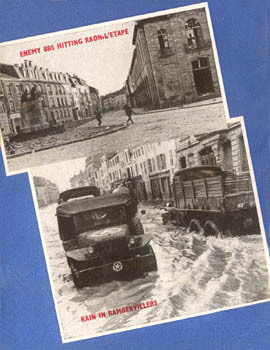 This booklet is one of the series of G.I. Stories published by the Stars & Stripes in Paris in 1944-1945. This is one of a series of G. I. 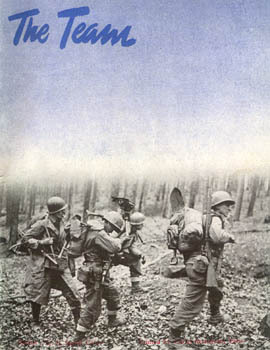 Stories of the Ground, Air and Service Forces in the European Theater of Operations, issued by the Orientation Section, Information and Education Division, ETOUSA... Major General W. A. Burress, commanding the 100th Infantry Division, lent his cooperation; basic material was supplied by his staff. The story this booklet tells is not yet complete. Here you have only the first and second chapters of the story of the 100th Division; the first, our days of rigorous training in the United States, and the second, the beginning of our combat experiences. The purpose of this pamphlet will have been accomplished if it succeeds in recalling for old-timers and informing newcomers of the basic traditions we have built in the past and which we intend to carry on. My congratulations to all of you for the superior job you have already performed and my best wishes for your continued success. OV. 1, 1944: It was a cool, rainy day in a dismal sector of the Western Front near Rambervillers, France, when Cpl. Fred Pisano, Lodi, N.J., Btry. B, 925th FA Bn., jerked the lanyard of his 105mm howitzer and sent a shell screaming into the German lines. This was a big moment. That shell was worthy of attention because it was the first round to be fired by the 100th Infantry Division in World War II. That shell carried a special meaning to more than just the men of the 100th. Not only did it signal the division's initial action, but with that shot Centurymen established some kind of a record for getting into combat with a speed that would have dazzled the old-timers. Exactly 12 days before that chunk of 105mm ammunition dropped into some German lap, the convoy transporting the division had sailed peacefully into the wrecked, but still beautiful, harbor at Marseille — 400 miles away from front lines. The convoy, first to make a landing at France's largest seaport since the area had been liberated, arrived directly from the States. The 100th, like other units, left home with equipment packed and loaded so it could not be removed immediately from the ships and put to front line use. Normally, the program called for a lay-over near the port during which cargo vessels would be unloaded, equipment issued, other equipment unpacked. This procedure suddenly was changed when Sixth Army Group ordered one combat team to be ready to go into the line by Nov. 1. Seventh Army and its three infantry divisions — the 3rd, 36th and 45th — which had made the initial landings in Southern France in August and raced the Germans all the way up to Belfort from Normandy were tired. Doughs who had slogged all the way from the Riviera to the Vosges Mountains needed a rest. But the 100th Div., first reinforcement to appear for Army, was on the continent and it was wanted badly at the front. It was a tough order to fill. Maj. Gen. Withers A. Burress, Richmond, Va., who had commanded the Century Division ever since its activation, had to take quick steps to get his own green troops equipped and ready to move. Large quantities of material had yet to arrive in the harbor; more was waiting to be unloaded from ships already at anchor. HE rush job was accomplished by Oct. 29, and the first combat team — the 399th Inf., 925th FA, attached engineer and medical units, plus the forward echelon of division headquarters — pulled out of Marseille for the three-day motor movement to the Seventh Army front. With overnight bivouacs near Valence and Dijon, the 399th Combat Team reached the front Oct. 31, just 11 days after debarking at Marseille. The 399th went into line, relieving the 179th Inf., 45th Div., veterans of Sicily, Italy, Anzio and Southern France. It had been a fast trip — as fast a transition as any outfit ever made from boat to combat, but the 100th took it in stride. Part of the division still was in Marseille when the 399th went into the line near St. Remy Nov. 1, but on successive convoys the remainder of the outfit arrived in the north. By 0600, Nov. 9, the relief of the 45th was complete. The 100th assumed full control of its portion of the VI Corps front. If the move from the States to the front lines was at lightning speed, then the division has had little chance to catch its breath since. The Century never once was out of contact with the enemy until late March, 1945. Its string of consecutive days in combat rose to 146, a long stretch for any outfit. No other new division in the American Army can boast of such a stretch on its first trip into combat. over its own sector, the 100th became the first American unit to crack the German winter defensive line in the area near Raon-l'Etape. In two weeks, the Century had contributed to the complete breaching of the "impregnable" Vosges Mountains. Veterans were made overnight in that fighting. For individual heroism in this early battle, two Centurymen later were awarded the Distinguished Service Cross. Lt. Paul F. Loes, Cascade, Iowa, received the decoration for silencing a concealed machine gun under concentrated artillery and mortar shelling near St. Remy, Nov. 4. Crawling within 10 yards of the enemy position, the 399th Inf. officer single-handedly destroyed the entire gun crew. Cpl. Robert L. Ethridge, Rome, Ga., 375th FA, was awarded the DSC posthumously for his extraordinary heroism in holding off an enemy ambush at a road block near Thiaville, Nov. 8. Enroute to a new gun position, the truck carrying Ethridge's crew was met by automatic fire which cut off escape to the rear. His handling of the truck-mounted machine gun temporarily stopped hostile fire and enabled his buddies to escape. Ethridge, however, was fatally injured. After the entire division had taken up its positions just east of Rambervillers, on a line running approximately parallel to the Meurthe River, the 397th and 399th Combat Teams were moved out of the line. Crossing the Meurthe at Baccarat, the northern tip of the sector, they took up new positions southeast of the city on the enemy-held side of the river. The 398th remained on the original front and, with the 100th Recon Troop, held the entire line. ITH the stage set, the 100th, after only three days of combat experience, jumped off Nov. 12 as part of Seventh Army's gigantic winter offensive. The VI Corps plan called for the 397th and 399th to clear the northern side of the Meurthe River where the entire Corps had been stopped cold up to that point. Moving abreast, the two regiments drove along the river toward Raon-l'Etape, key supply and communications center. The 397 occupied Bertrichamps the first day, then blasted through the dense woods, mud and rain to capture Clairupt two days later. Both teams struck a stone wall when they smacked the German winter defensive line in the Vosges between Neufmaisons and Raon-l'Etape. Whipping past Neufmaisons, 3rd Bn., 399th, captured Hill 409-431 after a furious battle while 1st Bn. moved against Hill 462.5. 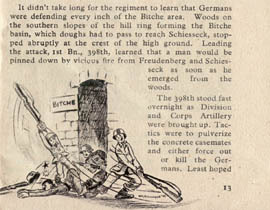 The bitter clash for the weapon-bristling wooded height that was Hill 462.5 typified the battle for Raon-l'Etape and wrote one of the first important pages in the division's combat story. Coming only two weeks after the 399 lunged into combat, 1st Bn., commanded by Lt. Col. Elery Zehner, Washington, D.C., stepped off on a line covering a 1000 yard front in an advance across the clearing to the ominously silent hill. Even without opposition, the ascent up this rocky elevation would have been difficult for Centurymen, burdened with weapons and ammunition. As it was, they met deeply-entrenched automatic weapon emplacements before getting halfway up. Taking the steepest grade on the assumption that enemy weapons would be directed to the more gradual incline, 399th doughs crawled through brush and overhead fire toward the top. By eliminating or temporarily silencing machine gun nests from the rear with hand grenades, Co. A reached the summit first, fanning out to fight over three knolls. Cos. B. and C followed and joined in the battle to take and hold these commanding positions. On the center knoll, an enemy counter-attack developed from below but heavy fire power maintained the hard-won foothold. Then began the strength-taxing job of evacuating wounded and bringing up ammunition. By nightfall, 1st Bn. was perched atop the peak. Resistance was broken. With the occupation of that high ground, which was behind the enemy defensive line and allowed observation and fields of fire over the entire area, Germans were forced to withdraw. The 100th celebrated the second anniversary of its activation Nov. 15 by surging forward again. The way now was open for VI Corps to cross the Meurthe and launch its drive toward the Alsatian Plain. HIS first major action of the 100th was marked by many acts of the finest soldiering. Outstanding was that of Lt. (then T/Sgt.) Rudolph Steinman, 399th. The 46-year-old Chicagoan, commissioned on the battlefield, maneuvered along to the enemy flank during a company approach march, fired his carbine into a machine gun nest, killing one Nazi, disorganizing the enemy and forcing 16 to surrender. This action paved the way for an ammunition detail to bring badly needed supplies to the main body ahead. Lt. Steinman later was awarded the Distinguished Service Cross. During the action before Raon-l'Etape, Col. William A. Ellis, White Plains N.Y., 397th CO since activation, was killed. Lt. Col. John M. King, Baltimore, Md., 1st Bn. CO, replaced him. In January, Lt. Col. Gordon Singles, Denver, Colo., was transferred to the division and took over command of the regiment. The battle became a race as the 100th pushed forward in full-scale pursuit of retreating Germans. Moyenmoutier, Senones, Belval and St. Blaise were added to the fast growing list of cities captured. Gains from 10 to 12 kilometers a day were made as the 397th spearheaded the division's advance in the Rabodeau River valley. At St. Blaise, Centurymen made a junction with the 3rd Inf. Div. Nov. 23, then both began a race up the Bruche River valley. As the 399th took the lead in the division's chase, Salm, Abet, Frenconrupt, Bacquenoux, Wachenbach, Lutzelhouse, Netznebach, Schirmeck, Urmatt, Niederhaslach and Oberhaslach were buttoned up in quick order. Schirmeck, key town where the Plaine and Bruche River valleys join, commanded the route of approach for a possible German counter-attack. The threat was eliminated when the 399th swarmed into the town. While the main effort was being made up the Bruche River valley, 1st Bn., 398th, and 117th Recon Sqdn. swept up the Plaine River valley from Raon-l'Etape to clear all enemy resistance, capturing Celles, Bionville, Allarmont, Vexaincourt, Luvigny and Raon-sur-Plaine. ITH the Vosges campaign over by Nov. 26 except for mopping up, and with American forces ready to spill out onto the Alsatian Plain, the 100th was ordered north to the toughest part of the XV Corps sector. In recognition of his leadership in the division's drive through the Vosges, Gen. Burress was awarded the Bronze Star by Maj. Gen. Edward H. Brooks, VI Corps commander. Indicative of the action, the commendation stated that "Gen. Burress' vigorous leadership and skillful execution of the 100th Division drive through terrain previously regarded as virtually impregnable reflect great credit upon himself and the military service." The 100th Infantry Division made a marked contribution to the success of the VI Corps attack, first, by the capture of Raon-l'Etape, an operation which breached the hinge of the German defensive position and at the same time drew forces from the center where the main attack was to be made; and second, by the prompt capture of Schirmeck, which blocked the enemy on the left and permitted the main attack to push through without delay. Your fine division has written a bright page in the military history of our armed forces. The Century arrived at the XV Corps area near Saarbourg Nov. 27, the 397th Combat Team moving directly to front lines — attached to the 45th Inf. Div. — while remaining troops stayed in Corps reserve for several days. The entire division hit the line again Dec. 3 with one of the toughest missions any division had been assigned. Relieving the 44th Inf. Div. 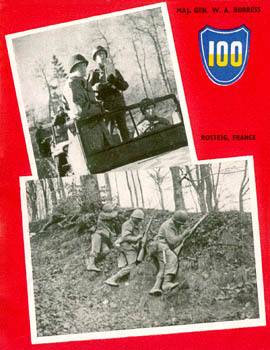 of part of its sector, the 100th was to drive northeast and breach the Maginot Line near Bitche, heart of the entire fortifications system. With the 398th jumping off towards Puberg and Wingen, the division launched its new offensive. The regiment's 2nd Bn. wheeled into Puberg that day, but 1st Bn. ran into stiff opposition at strongly-held Wingen. Artillery softened up Wingen with heavy shelling while the 398th occupied Rosteig against moderate opposition. The regiment finally smashed into Wingen Dec. 5, occupying both the town and the surrounding high ground. The 397th Inf. and 100th Recon Troop, both attached to the 45th Div., were ordered to fight to the division sector. On the way back, they captured Rothbach, Reipertswiller Lichtenberg and Wimmeneau. CCUPYING Wingen, 3rd Bn., 399th, passed through the 398th and carried the division's advance to the north astride the Wingen-Lemberg road. Meeting no enemy resistance, the advance roared forward. Next day, by 0930 Goetzenbruck and Sarreinsberg had been taken. The battalion bumped into a stone wall of resistance when it reached Lemberg. Although the town was encircled by nightfall, the beginning of a bitter four-day struggle was underway. Artillery pounded Lemberg as 399th's three battalions pushed ahead to take high ground surrounding the town. Nazis fought doggedly under a "fight-to-the-last-man" order. When 2nd Bn. cut the Lemberg-Bitche road and railroad Dec. 8, 1st Bn. ripped into the town. 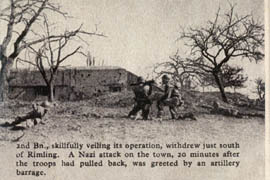 After house-to-house fighting during the night and early morning, the battalion completed occupation and mopping up of Lemberg. Meanwhile, the 398th was taking Soucht and Meisenthal as 397th overran Melch and Wildenguth near Wimmeneau. The 3 ran into another of the "last-man" bastions, when it reached Mouterhouse. Against bitter opposition, the regiment surrounded the town Dec. 6, blasting it with artillery. Next day, in the face of heavy mortar, automatic weapons, and small arms fire, 1st and 2nd Bns. entered the town and spent the next two days cleaning out lingering enemy resistance. After Lemberg's fall, 398th passed through the 399th and moved northward toward Bitche and the Maginot Line to carry the brunt of the division attack. The 397th continued to drive east abreast of the 398th. Col. Paul G. Daly, Southport. Conn., who took command of the 398th when Col. Nelson I. Fooks, Preston, Md., was transferred, was wounded, and Lt. Col. Robert M. Williams, Greenville, Tex., former 3rd Bn., 399th Inf., CO, took over. HE famous town of Bitche, into which the 100th was to drive, nestled in a valley formed by a number of high hills. A natural strongpoint, the hills housed the four strongest forts on the entire Maginot Line—Simserhoff, Schiesseck, Otterbiel, and Grande Hohekirkel. With the exception of Simserhoff, the forts were directly in the path of the 100th. In addition, several smaller one-pillbox forts, including Freudenberg, were scattered in the "Ensemble de Bitche," filling gaps between the larger installations. This system of fortifications never before had surrendered. In 1940, the French had held out here against Germans until the armistice was signed. When 2nd Bn., 398th Inf., occupied Reyersviller Dec. 13, the last obstacle before the Maginot Line was removed. The plan called for the 398th to reduce Fort Schiesseck, then move around to the hills north of Bitche. With such protection, the 399th was to move into the town while the 397th, remaining on the division's right flank, would be poised to occupy Camp de Bitche, a military camp to the east. Schiesseck, consisting of 11 separate casemates connected by underground tunnels, was on the left flank of the 100th's sector of advance. On a hillside overlooking the basin almost devoid of woods, the fort commanded a wide field of the over every avenue of approach. In addition, one casemate, Fort Freudenberg, was to its south, directly in the path of 398th doughs trying to approach the larger fortress. Because divisions in other sectors had been meeting only token resistance, or none at all, Gen. Burress decided to drive the 398th into Freudenberg and Schiesseck as soon as the division reached the line. Should the line be undefended here, as it had been in other sectors, he did not want to delay advance with unnecessary preliminary preparations. At the same time he was cautious, knowing that the Bitche Sector was a natural strongpoint. The 398th was ordered to wait for further support if it hit strong opposition. It didn't take long for the regiment to learn that Germans were defending every inch of the Bitche area. Woods on the southern slopes of the hill ring forming the Bitche basin, which doughs had to pass to reach Schiesseck, stopped abruptly at the crest of the high ground. Leading the attack, 1st Bn., 398th, learned that a man would be pinned down by vicious fire from Freudenberg and Schiesseck as soon as he emerged from the woods. The 398th stood fast overnight as Division and Corps Artillery were brought up. Tactics were to pulverize the concrete casemates and either force out or kill the Germans. Least hoped for was to make them button up their portholes so that doughs could advance. Because of the open ground surrounding the forts, infantrymen were unable to get close enough to the emplacements to employ flame throwers and dynamite. Shortly after dawn, the artillery of Brig. Gen. John B. Murphy, Amarillo, Tex., opened up. Throughout the day, everything from 240mm and 8-incher to infantry 105 howitzer shells plastered German positions. Two captured German 88s were mustered into service. A direct hit eliminated Fort Freudenberg. Schiesseck was a different problem. Four-foot thick concrete cupolas with seven-inch steel doors and gun turrets ignored the explosives. Forward artillery observers saw some 240mm and 8-inch shells ricochet from casemates and explode in air. Fifty-four Thunderbolts went up during the shelling, dropping 27 tons of 500-pound bombs. But aerial explosives had no more effect on the fortress than ground shelling. Biggest lesson learned that day was that artillery alone could not destroy the forts; indirect artillery fire was not forcing the enemy to abandon his guns long enough to allow infantry to move in. Three of 11 casemates at Schiesseck were of the disappearing turret type, one housing twin-mounted 75mm guns. The remainder of the pillboxes had cupolas and portholes through which 80mm mortars, automatic weapons, and anti-tank guns could be fired. Moreover, all blocks had tubes through which hand grenades could be rolled on attackers. Although an 8-inch shell knocked out one of the disappearing turrets while it was up, the fortress still could spout tremendous fire on troops attempting to approach it on foot. EXT day, tactics were changed slightly; direct artillery support was brought into play. Units of the 90mm TDs and M12 155mm "Long Toms" were moved up to the hill's crest to fire at point blank range. Heavier artillery was shifted to positions just behind the hill where it could give closer support. That turned the trick. Germans had to stop firing and withdraw to underground portions of their casemates. Their first opportunity to advance in two days, 398th's 3rd Bn. doughs, smashed at the fortress with a vengeance. Centurymen charged forward while shellfire still boomed on the forts ahead. Three hundred yards from their objective artillery lifted. Doughs now had time to reach the blocks before enemy guns resumed firing. With the engineers, they went to work. Artillery blasted adjacent blocks to keep them buttoned up. One by one, casemates fell and as grenade-tossing doughs kept Nazis from gun ports, engineers dynamited the pillboxes, ruining them for further use. Finally, after days of fierce combat, the last Schiesseck casemate was neutralized. The 398th took a deep breath as it consolidated its hard-won gains. Meanwhile, the 399th had pushed its front close to Bitche so it could move into the town after the 398th captured high ground to the north. The Powderhorn men captured College de Bitche on the outskirts, occupying it as a forward position. The 397th held a position on the hills to the east overlooking Camp de Bitche. This was as far as the 100th drive went. Four days previous to the capture of Fort Schiesseck, Dec. 20, the large-scale German counter-attack in Belgium had started. On the left flank of Seventh Army, Third Army was ordered to move north to help repel the enemy drive. Since its front would have to be extended to cover the area vacated by the Third, Seventh Army was ordered to defensive positions. S a part of the fanning-out defense on Army's front, the 100th was ordered to withdraw from Fort Schiesseck, untenable for defensive operations because Germans held all adjacent forts. Set up temporarily at better defensive positions on high ground to the south, the division immediately was told to increase its sector to the left. By Dec. 22, the shift was completed and the front became quiet with both sides employing defensive tactics. It was during the Bitche operations that Brig. Gen. Maurice L. Miller, Syracuse, N.Y., Asst. Division Commander since activation, was evacuated through medical channels. Replacing him briefly was Brig. Gen. John S. Winn, Jr., but the position was permanently filled at the turn of the year by Col. Andrew C. Tychsen, Haddonfield, N.J., 399th CO. Taking Col. Tychsen's post Dec. 27 was Lt. Col. Elery Zehner, 1st Bn. CO. On Jan. 12, Col. Edward J. Maloney, Ware, Mass., who had been transferred into the division, became 399th CO. HE week of relaxation was abruptly ended at 0015 New Year's Day when the German counter-offensive crashed the Seventh Army front with the brunt aimed directly at the 100th Div. sector. 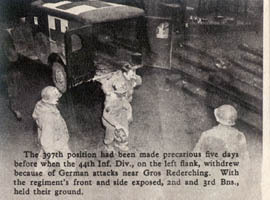 Third Bn., 397th, was the first to be hit. On the division's left flank near Rimling, the battalion repulsed the thrusts. The 100th's entire right flank was exposed when 117th Recon Sqdn., holding a portion of the front to the east, was hit by powerful German forces. Unable to hold against the onslaught, the squadron dropped back several thousand yards. On the same flank, the 399th was faced with the serious problem of maintaining a line to the front and extending another to the right to prevent Krauts from infiltrating into regimental and division rear areas. By skillful maneuvering of troops and tenacious fighting on the part of its forward elements, Powderhorn men stretched their front into a L-shaped line which, although dangerously thin, held off repeated German stabs. The 141st Inf., 36th Div., was attached to the 100th Jan. 2 and put into position to help the 399th stem the tide at the Bitche salient. Although activity on the front quieted down for several days after the Germans had established their spearhead at Bitche, the attack was not over. Germans hit 2nd Bn., 397th, at Rimling Jan. 8, and a terrific two-day struggle for the town began. The 397th position had been made precarious five days before when the 44th Inf. Div., on the left flank, withdrew because of German attacks near Gros Rederching. With the regiment's front and side exposed, 2nd and 3rd Bns., held their ground. The courageous stand of 3rd Bn. 's Co. K was indicative of the bitter fighting during this siege. Throughout six days of holding a nearly isolated hill above Rimling, defenders couldn't leave their foxholes because of intense artillery and mortars. German ground troops drove on Co. K's positions in waves but the tiny garrison clung tenaciously. When tanks appeared on the opposite ridge the second day, artillery knocked out three, dispersed the others. There were many remarkable feats. Most spectacular was the work of the heavy machine gun team of Pvt. Leon Outlaw, Jr., Mt. Olive, N.C., and Sgt. Alphonse Myers, Amsterdam, N.Y. Working on Sgt. Myers' target instructions, Outlaw squeezed off amazingly accurate automatic fire during the heavy shellings, and at ranges up to 800 yards, accounted for more than 100 dead Germans. S/Sgt. Donald L. Butcher, Zionsville, Ind., taking charge of a platoon, maintained the men in position by making periodic checks of the holes during the siege. Wiremen, chosen by Sgt. Butcher on the spot for the job, repaired frequently hit wires under the same conditions. The third platoon appropriated a machine gun from a disabled American tank to keep its foothold. Rations arrived irregularly; water, rarely. It took one man a whole day to bring two boxes of ammunition from the town to Outlaw. Until they were ordered to retire, men held their positions. A kingpin in the defense of Rimling itself was 2nd Bn., 397th. In the terrific siege during which the town was jointly occupied by Yanks and Germans, the heroism of T/Sgt. Charles F. Carey, Jr., Cheyenne, Wyo., always will be remembered by Co. F. Sgt. Carey directly accounted for 41 prisoners, 15 dead, one Mark IV tank, and directed a TD in destroying a Nazi flak wagon and two Tiger tanks. In addition, this one-man Army twice cleaned out one section of the town after the Nazis had come in. The bazooka-carrying sergeant fell before sniper fire but only after he had done more than his share of keeping the German attackers at bay. HEN the second attack came Jan. 8, the positions were impossible to defend. Germans charged from three sides and pounded continually for two days. Finally, 2nd Bn., skillfully veiling its operation, withdrew just south of Rimling. 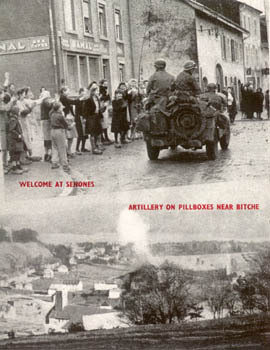 A Nazi attack on the town, 20 minutes after the troops had pulled back, was greeted by an artillery barrage. Net result of the 100th's defense during the entire counter-attack was that it was the only division on the entire Seventh Army front to hold its original ground. The enemy had come from two directions, Bitche on the right and Rimling on the left—and had come with his fullest force, but the Century held its ground. When the Nazi offensive had ended, the 100th Div. sector protruded ahead of all the rest of the Army line. The rugged American stubbornness of the combat elements of the 100th Infantry Division has played a tremendous part in stemming the tide of attack by superior enemy numbers. In the area of Rimling you successfully repulsed enemy attempts to penetrate your lines; your great accomplishment forced the enemy to give up the offensive action on your front. Inflicting great losses to strong elements of three enemy divisions, you have successfully protected an important sector in the Hardt Mountains. When the force of the powerful enemy drive carried him into a salient in the Bitche area, the prompt and effective extension of your lines to block his advance was a splendid example of skillful maneuver. I heartily commend all members of this Division for their outstanding achievements. 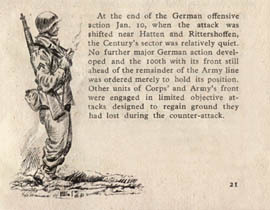 At the end of the German offensive action Jan. 10, when the attack was shifted near Hatten and Rittershoffen, the Century's sector was relatively quiet. No further major German action developed and the 100th with its front still ahead of the remainder of the Army line was ordered merely to hold its position. Other units of Corps' and Army's front were engaged in limited objective attacks designed to regain ground they had lost during the counter-attack. N March 15, 1945, the division launched a history-shattering operation which ended its three-month non-offensive stand. As part of the Seventh Army, Centurymen jumped off on the drive which was synchronized with Third Army action to wipe out all German resistance in the Rhineland south of the Moselle. The 100th now returned to the work it left unfinished in December — the task of taking the tough Maginot Line fort city of Bitche. In a three-regiment operation, the move was rapid, complete. Artillery was withheld and all was quiet when the Century began its surge at 0500. The 397th steamed ahead to capture the high ground north of the fortress and grabbed Schorbach by noon. The 399th, at the same time, attacked Reyersviller Ridge to the southwest. In this fast action, Germans on the western side of the elevation were trapped and open for other 399th elements which kicked off 25 minutes later. The frontal assault against the once impregnable line was made by the 398th which sneaked forward to seize Freudenberg Farms, Fort Freudenberg and Fort Schiesseck on the high ground northeast of Bitche. The engineers had done their demolition work well in December and only small resistance was met at temporary Schiesseck trenches outside the blasted cement pillboxes. Mines were numerous but most of these had been emplaced in the winter months and were not buried. Engineers cleared heavy road blocks and filled in huge craters along the approach routes. Next day, the 398th climaxed the "powerhouse" play by marching into the city, with 2nd Bn. 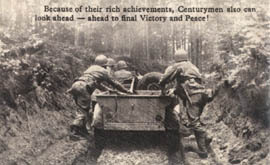 leading the advance, as 1st Bn. assaulted Fort Otterbiel. Seventy-five PWs were taken in house-to-house scouring. CPs were set up in short order. First U.S. flag to fly over the city was given Capt. Thomas Garrahan, Brooklyn, N.Y., Co. E CO, by a former American resident living in Bitche. In the closing round of the two-day fray, elements of the 398th and 399th — which had been moving east upon Camp Bitche — joined the 781st Tank Bn. to clear pillboxes and rout 70 Germans. With the entrance of these troops in Bitche, some 200 years of military defensive history was shattered. The city first assumed strategic importance in the middle 1600's when King Louis XIV ordered the French engineer Vauban to erect a citadel on the city's central hill as part of a defense series. In the closing days of the War of 1870, this bastion held off the German assault up to the French capitulation. After the last war, France built the $500,000,000 Maginot Line and, at Bitche, constructed the strongest layout its the southern chain of the system. This fortress held off the German invaders in 1940 until the French armistice. HE Century Division's occupation of Bitche was the first in the bastion's history. Leading up to it was the terrific December siege and the preparation immediately before the March undertaking. For the latter operation an outstanding contribution was the XII TAC blasting of the targets in close support of troops. Artillery also played a major role in firing counter-battery rounds just after the take-off, German artillery and mortar positions on Otterbiel were silenced almost immediately after the move began. In its brief stay at Bitche, the division received the gratitude of residents in a formal ceremony at which Gen. Burress became the first Citizen of Honor in the town's history. Following a unanimous vote of the town council, Mayor Paul Fischer presented the general with a document entitling him to the honor in "testimony of gratitude in behalf of citizens of Bitche" for the American division's freeing of the city. reducing Fort Schiesseck during the December fighting. The unit was described as "fighting its way up the steep barren slope of the difficult terrain and through barbed wire entanglements." Against these defenses, and thick concrete pillboxes housing elevating artillery pieces, the order stated, the battalion reduced the fortifications after the artillery barrage preceding the attack. "The fighting aggressiveness, courage, and devotion to duty displayed by members of the Third Battalion are worthy of the highest emulation and reflect the finest traditions of the Armed Forces of the United States." But the taking of Bitche did not end hostilities for the 100th. Moving northeast, generally along the German border between the towns of Dietrichingen and Walschbronn, the division began as fast a pursuit-race as any it had run. This was the 60-mile lightning drive through the Siegfried Line and the arrival outside of Ludwigshaven on the Rhine River two days later. The Century whipped through the rough Hardt Mountains, passed streams of German PWs and freed Allied prisoners. At German towns, the only recognition of the American advance was white flags hanging from buildings. Near Ludwigshaven, the 399th met elements of Third Army's 94th Division, which had moved south in the wake of the 12th Armd. Div. Meanwhile, 3rd Bn., 399th, drove south of the city to get the first glimpse of the Rhine at Altripp. In the tank-infantry move, each of the outfit's three companies claim theirs was the first to arrive, but all were agreed the battalion was first. While organized resistance ceased west side of the Rhine, PWs were taken everywhere—on the road, in buildings, in cellars. By March 25, the division had taken more than 900 during the period from the jump-off at the original line, to the arrival at the Rhine. The 100th has served under three Corps—XV, XXI and VI, under which it had first operated when it entered the line in the Vosges. 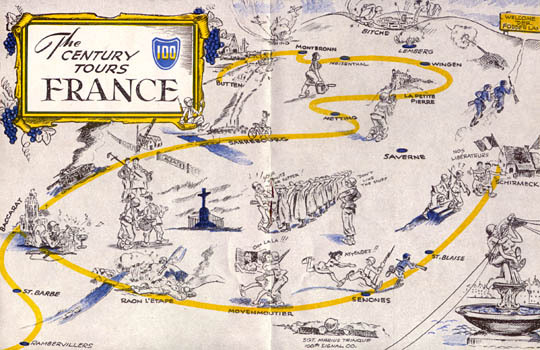 year of conversion from citizens to soldiers at Ft. Jackson, S.C.; the rough three months of Tennessee maneuvers in the winter of 1943-44; and, the advanced training at Fort Bragg—all contributed to the Centurymen's fighting know-how. By the time the Century Division embarked for the ETO, Oct. 6, 1944, its men felt it was a good outfit. They were ready to put out everything they had with the experience they had gained in training. They had, indeed, come a long way from the day when the 100th Inf. Div. was born at Ft. Jackson. N Nov. 15, 1942, approximately 2000 officers and men stood in formation as the division flag passed into the hands of Gen. Burress. The division had officially entered the "birth" list of the War Department, and the XII Corps commander, Maj. Gen. William H. Simpson (now Lt. Gen. and Ninth Army commander) charged the assembled cadre with the mission of making the division a "fighting 100th." At this activation ceremony, all 54 organizations of the division came officially into being: three infantry regiments, 397th, 398th, and 399th; four artillery battalions, 373rd, 374th, 375th and 925th and Div Arty Hq. and Hq. Btry. ; 325th Engr. Bn. ; 325th Med. Bn. ; 100th Sig. Co.; 100th QM Co.; 100th Ord. Co.; 100th Recon Troop; Div. Hq. and Hq. Co. and the 100th MP Platoon. Personnel started with 1100 men from the 76th Inf. Div. at Ft. Meade, Md., and a good percentage from the 1st Inf. Div. Under Gen. Burress, the officer staff was chosen by higher headquarters from a dozen other organizations, with most junior officers coming from OCS. Troops arriving the next month came largely from eastern states. The big change-over from citizen to soldier for the 15,000 new Centurymen had its setting in South Carolina's sandy soil, raw rain, and in Ft. Jackson's garrison hutments previously occupied by the National Guard's 30th Inf. Div. Nearly every man was doing a brand-new job—from division commander to new troops. It was the general's first command of a division, the first time that many officers had held their particular jobs, junior officers' first command of men, newly-made non-coms' first experience in handling men—and, for the new arrivals, their first taste of Army life. The 100th looked good at the end of its basic training period. XII Corps said the results of its training tests were "very satisfactory." Training developed through the year's stay at Ft. Jackson, running through squad, platoon, company, battalion, and regimental training on the reservation. Three months after basic training began in early April, the division was ordered to guard the entire 252-mile roadbed of the Atlantic Coast Line in South Carolina for the late Pres. Roosevelt's inspection tour. Highly secret, none of the troops knew what it was all about—only knowing that it cancelled a week end's relaxation after the first trip into the field at Ft. Jackson. Only after it was all over did Centurymen learn the identity of the man whose train they guarded. BOUT the same time, baseball enthusiasts took to the diamond. 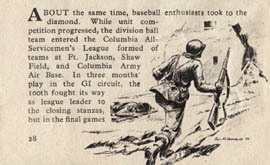 While unit competition progressed, the division ball team entered the Columbia All-Servicemen's League formed of teams at Ft. Jackson, Shaw Field, and Columbia Army Air Base. In three months play in the GI circuit the 100th fought its way as league leader to the closing stanzas, but in the final games fell before the slants of Shaw Field's George Turbeville, former Phillies' pitcher. 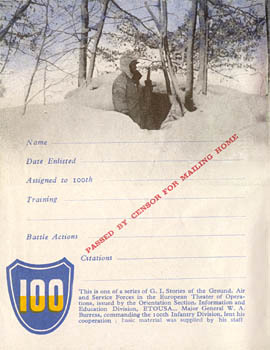 The division, however, nosed out its persistent post rival, the 106th Inf. Div., for second place. Centurymen had a fling at drama too when they staged "The Eve of St. Mark," produced by Special Service. The Broadway hit of this war was presented twice on the post and twice at Columbia's Town Theater. Early in the year, the division began publishing its own newspaper, The Century Sentinel, which has continued since. Special training activities stood out above the regular run. The Nazi Village, constructed by the 325th Engrs., provided a street for practice in fighting which was soon to come in France. Through the summer, the division fought the "battles" of Ft. Jackson and northern South Carolina. In early summer, a 32-man detachment of the MP platoon sailed for prisoner duty aboard ships from Africa to the States. In this first trip outside the country for a division unit, MPs began their two round trips from Newport News July 4, 1943. Arriving in Casablanca, Centurymen brought prisoners to Boston, then returned to Oran for a second consignment of Germans captured in Sicily. The entire division witnessed one of its most spectacular training demonstrations in late August. In a combined aerial-artillery opening barrage, mock pillboxes were the targets of live ammunition and bombs. A battalion of infantry wound up the demonstration by firing all its weapons on hill objectives. OV. 15, 1943, exactly a year after it was born, the 100th's last truck pulled out of Ft. Jackson for its first big-time training operation—Tennessee maneuvers. In eight problems staged in extremely crisp weather, the 100th was among the first organizations to train there in the winter months. Teaming up with, and against, the 35th and 87th Inf. Divs., the 14th Armored, plus many supporting elements, including TDs, air and service troops, the Century learned to live and fight in the field. It was a grimy but field-toughened division that moved from the maneuver area in mid-January. Living in freezing weather, in rain and snow, catching chow as time and the situation permitted was rough, but Centurymen felt a confidence in themselves, in what they could take and what they could dish out. HE 100th's new home was Ft. Bragg, N.C., which had been occupied last by the 13th Airborne Div. Here, the division began things easily—getting accustomed gradually to showers, beds, linen—and all men had furloughs. By February, the division launched into advanced phases of training designed to blend the organization into a fighting team. Combined attack exercises, training with tanks, and instruction in handling mines formed a busy schedule. One phase of the program, combined infantry-artillery assault problems employing live ammunition, was so unusual that it attracted the attention of the War Department. Among those who came to witness the siege-advance were Secretary of War Henry L. Stimson; Undersecretary of War Robert P. Patterson; Assistant Secretary of War John J. McCloy; two parties of the country's leading editors and newsmen. Another signal distinction came to the division in March during its Ft. Bragg training. The War Department, in an effort to give more adequate recognition to the role of the infantryman in training and combat, was about to issue Expert and Combat Infantryman Badges. The Century was selected to conduct necessary tests and to award the first of these Expert Badges. Coming out on top for the award was T/Sgt. Walter L. Bull, Baltimore, Md., Co. A, 399th, who, later in France, became the first man in the 100th to be commissioned on the battlefield. At a division review at Ft. Bragg, the late Lt. Gen. Lesley J. McNair made the presentation of the first blue-and-silver badge. An unusual honor came in June, 1944, when the 100th was selected by the War Department to send a composite battalion of infantrymen to parade in New York City on the nation's first Infantry Day. Coinciding with the launching of the Fifth War Loan Drive, Centurymen marched along Fifth Avenue, Lower Broadway, and at various rallies about the city during a two-week period. The same month, Col. Richard G. Prather, Hickman, Ky., joined the division as chief of staff, succeeding Col. Mark McClure, Anderson, Ind., who was transferred to the 95th Inf. Div. as artillery commander. By late summer, shortly after an inspection by AGF Commander Lt. Gen. Ben Lear, the Century embarked on its pay-off mission. The entire division sailed from New York Oct. 6, arriving at Marseille Oct. 20. Today, battle-tested Centurymen can look back to that hasty trip from the port to front lines, rugged fighting in the dense Vosges, to the Maginot Line campaign, to the stellar defense against the Germans' never-to-be-forgotten New Year's Eve attack and to Bitche. They can look back now with a feeling of full satisfaction at a job well done. Because of their rich achievements, Centurymen also can look ahead — ahead so final Victory and Peace! Copyright 2003-2006, LoneSentry.com. All Rights Reserved.